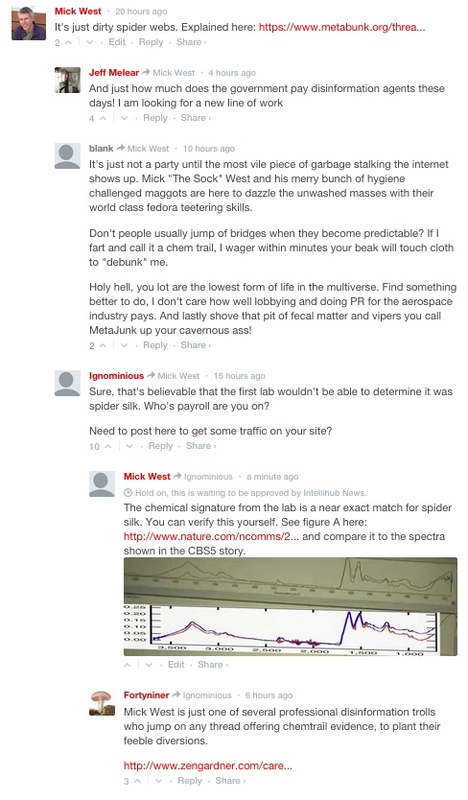 Discussion in 'Contrails and Chemtrails' started by Mick West, Dec 6, 2014. Earlier this month, Arizona's CBS 5 reported on the story of a local woman who had observed some planes fly overhead, and then noticed some fibers (as in the image above). First she saw them floating in the air, then later saw some clumped together on a fence. Reporter Greg Argos took some samples of these to a lab, where scientist Melissa Beddow suggested they might be biodegradable gauze used on cattle. However the fibers are almost certainly spider silk. There are three reason why this is so. The local woman, Marie Snow, first described the fibers in the air as "what looked like 50 foot long spider webs [...] continuous and glistening in the sun". Long thin gossamer cobwebs in the air, glistening in the sunlight, is something most people are familiar with. The origin of the web might be unfamiliar to people though, it's actually from newborn spiders that spin a long strand of web into the wind, and use it fly away from their hatching place. 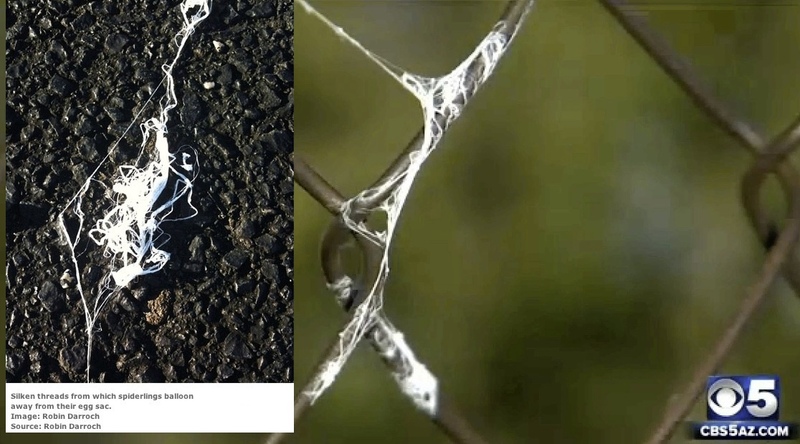 So later when she says of the fibers she found on the fences "it's thicker than a spider web", she is quite correct, because it's actually thousands of spider webs. These ballooning spiders are not uncommon in Arizona, and this is exactly the right time of year to be seeing them. Here's another local news story about the spiders, from Nov 12, about the same time as the CBS5 story. With Arizona’s southwesterly winds, the spiders who lift off here may end up in the Rockies or somewhere along the Great Plains, said Larry Stevens, ecology and conservation curator at the Museum of Northern Arizona. “Spiders are so abundant that literally billions of tiny spiders balloon off our landscape,” he said. "They're at the mercy of the wind." It’s most common for spiders to balloon in the fall because the babies have hatched from eggs that female spiders tend to lay in the summer. After dispersing, the insects overwinter in the juvenile state then grow to their full size in spring and reproduce in the summer, Stevens said. But what of the lab tests? Why wheat gluten flour and Bacitracin (or the similar gramicidin)? The reason for the confusions here is simply that the mixture of these substances is very similar to spider silk in its chemical composition, basically being a blend of peptides and proteins. Spider silk is a complex and variable mix of these, and could very easily be misidentified as mixture of other similar things - especially if you don't have it in your database. Spider silk is a natural polypeptide, polymeric protein and is in the scleroprotein group which also encompasses collagen (in ligaments) and keratin (nails and hair). These are all proteins which provide structure. The protein in dragline silk is fibroin (Mr 200,000-300,000) which is a combination of the proteins spidroin 1 and spidroin 2. The exact composition of these proteins depends on factors including species and diet. Fibroin consists of approximately 42% glycine and 25% alanine as the major amino acids. The remaining components are mostly glutamine, serine, leucine, valine, proline, tyrosine and arginine. Spidroin 1 and spidroin 2 differ mainly in their content of proline and tyrosine. Bacitracin is a mixture of related cyclic polypeptides produced by organisms of the licheniformis group of Bacillus subtilisvar Tracy, first isolated in 1945. Gluten is a protein found exclusively in certain grasses (genus Triticum ). It is a composite of two proteins, gliadin and a glutenin, bound to starch in the seeds of wheat and related grains. 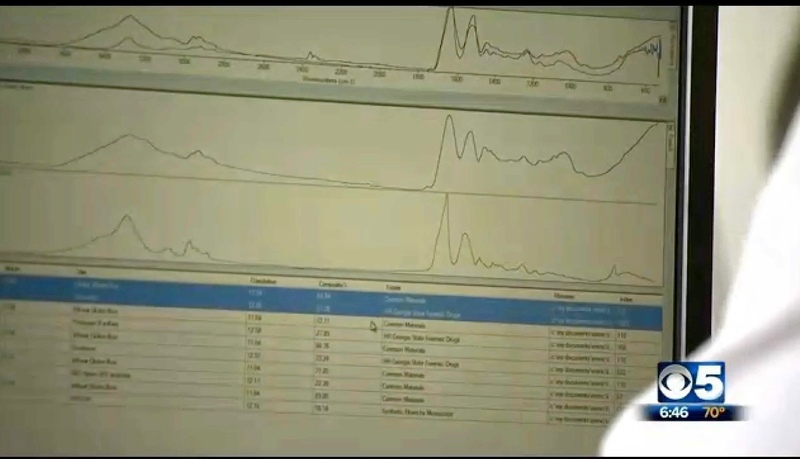 Remember the tests being done here are not deterministic, all it does is provide a rough signature, and then the computer compares it to things in the database and tries to figure out what it could combine together to make a match. It's basically guessing. See the various guesses in the above screen capture. In #1 it guesses Bacitracin, in #2 gramicidin. In #1 we have "80% Nylon 20% Spandex", in #2 Naphazoline, in #3 it's 2-Phenethlybenzyl alchohol. 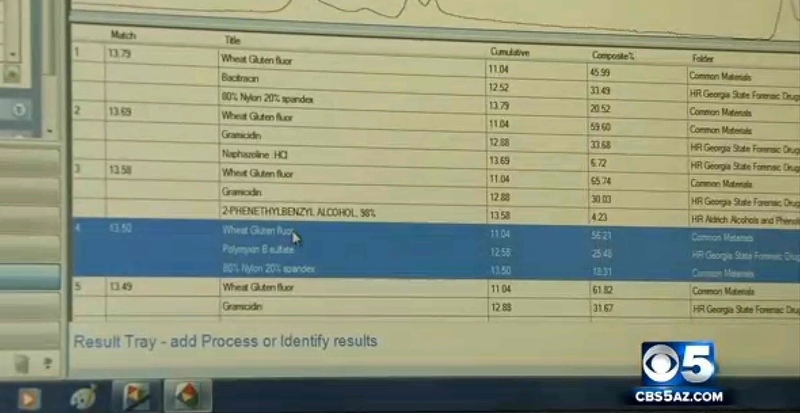 Beddow was then taking these computer guesses, and trying to come up with something that matched, so she theorized biodegradable antiseptic cattle bandages made of gluten. A good try, but of course would not explain the long fibers glistening in the air, or the fibers exactly resembling clumped spider silk. It also appears to be something of an imaginary product. So it seems almost certain that this is spider silk. However some additional tests performed by Shepard Ambellas suggest there are "metals" in the fibers. 1020 mg/kg of aluminum is 0.1% aluminum. This does seem rather high at first glance. However you have to remember that dirt is around 8% aluminum (10% in western states). So all this means is that the sample is 1% dirt by weight. This is hardly unexpected from a sample of old spider web stuck to a fence. The other metals were found in much lower quantities, consistent with background levels found in dirt. However this is a misunderstanding of what the MDL is. 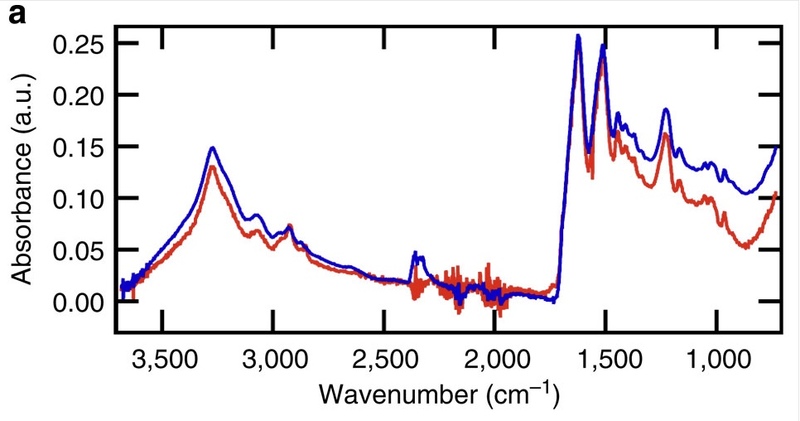 It's the Method Detection Limit, the value below which the substance cannot be reliably detected. So rather than being high, the values here are barely detectable. The second number RL, the Reporting Limit, is sometimes misunderstood as a value above which "report" it to some authority. But it's actually the value below which the substance can be detected, but not accurately measured. Q: What is the difference between a Reporting Limit (RL) or Reported Detection Limit (RDL) and the Method Detection Limit (MDL)? A: A Reporting Limit (RL or RDL) is the limit of detection for a specific target analyte for a specific sample after any adjustments have been made for dilutions or percent moisture. Some state regulatory programs require a laboratory to prove it can reliably "see" down to its RL by setting the RL at the lowest point on the calibration curve. In contrast, the Method Detection Limit or MDL is lower than the RL (often much lower) and is a statistical calculation. Since the MDL is below the point of calibration, results reported down to the MDL are not reliable and must be qualified as estimated values and, as such, carry a "J" qualifier designation. And notice the test method used was EPA 6010B, a very common method for detecting metals. However it detects aluminum the metal, and aluminum oxide (the mineral) exactly the same. So really it's not finding metals, just oxides of metals. Regular old dirt. 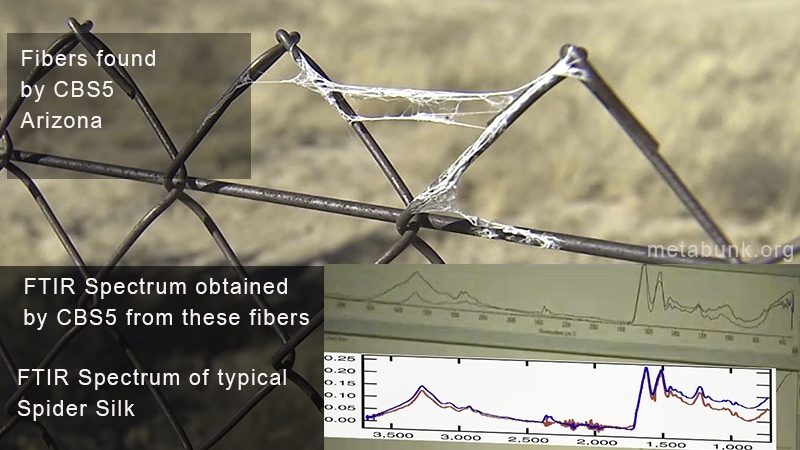 So this mysterious fiber is just some dusty spider silk. Nice analysis. I thought the "gauze bandage" explanation seemed a bit iffy. Isn't November a late time for spiderlings? Not in Arizona. This story was at the same time. My own experience with spider silk fall was in November. November is prime time for spiderlings in the southern US. I'm kind of angry at the TV station reporter and his editors on this one. I don't see much excuse for the errors they propagated with this story. Well the "edible cow bandages" theory came from the lab director. But yeah. It reminds me of the classic KTLA Barium story where the reporter got the units wrong. Also the "insects in a field" UFO story, where they badly used an entomologist. Problem is, once one "expert" expresses an opinion, it kind of gets stuck. There's an endless stream of stories like this in local news, and even occasionally in national news - like the Mystery Missile, where they had a fomer four star general looking a photo of an airplane contrail and saying he knew for a fact is was a missile. So now there's still lots of people who think it WAS a missile. Why would "hygiene challenged maggots" be at odds with "unwashed masses" ? Seems like we're all on the same team! Only a Brit could genteelly refer to such truculent responses as "lively replies"
Huh? (An Americanism....and proudly stated!!). Dragging > > >....back to topic. When spider fibers are mis-represented as some sort of "aerial spraying" shenanigans? How best to respond? Science and logic often do not work. So, what else to use? It seems (sometimes) a Sisyphean task. When spider fibers are mis-represented as some sort of "aerial spraying" shenanigans? How best to respond? I think here there's a very good chance of simply presenting the actual evidence. Now true believers and promoters like Ambellas will ignore you, but this is so clear cut that pretty much everyone not 100% down the rabbit hole should be able to see it's spider silk. It would be good if CBS5 did a correction though. You'd think they could do an interesting story just about the spiders, like the Arizona Sun did. Graphic is concise and unambiguous. Thanks for putting in the effort. Would be nice if CBS-5 would step up and hit the redo button. I emailed the reporter. Sometimes they respond. Looks like they are not interested in debate over on intellihub? I've posted twice in the comments section. One of my posts appeared and has now been removed. Looks like they have turned on the old get out clause of "awaiting moderation". I bet if I posted "I am being sprayed like a bug today by unmarked windowless aircraft" my post would magically appear! "Although aluminum is the most abundant metal in the earth's crust, it is never found free in nature." "All of the earth's aluminum has combined with other elements to form compounds. Two of the most common compounds are alum, such as potassium aluminum sulfate (KAl(SO4)2·12H2O), and aluminum oxide (Al2O3). About 8.2% of the earth's crust is composed of aluminum." Aluminum is derived from the ore bauxite. First bauxite is mined from typically shallow deposits, and then it is refined into alumina (aluminum oxide – Al2O3) using the Bayer process at an aluminum refinery. The aluminum, a powdery white substance, is then sent to an aluminum smelter where it subjected to electrolysis (Hall/Héroult process) which separates out the aluminum metal. Dunno about being banned - but certainly lampooned for not reading the thread. Aluminum is also a component of various sorts of clay. The percentage is not as high as in bauxite, but the common lab test will indicate it clearly. Feldspars make up 60% of earths crust according to wiki and have chemical compositions of KAlSi3O8 – NaAlSi3O8 – CaAl2Si2O8 - spot the Al in all of them. Is sarcasm or irony being used here? These are hard to do successfully in the written medium. Could someone please explain that post for me? Is he inadvertently debunking himself, or not understanding some of the phrases he is quoting from somewhere? I don't get it. I've given it as "thumbs down" in lieu of "wut?" FWIW: I understand that Al is not found in elemental form in nature. It is bound up in oxides silicates and needs some pretty high energy extraction processes to get an ingot of Al (which will have a thin layer of Al2O3 after all that effort). I must admit, I'm struggling to see what point hiilikeyourbird is trying to make. The focussing in on the phrase "Aluminum is not found free in nature" would lead me to assume that he thinks his previous description of how Aluminium is refined from bauxite in some way debunks the assertion that it does not occur naturally as 'free aluminium'. I just think that there are some very serious comprehension shortfalls here, but that's generally apparent when people start going on about aluminium being a 'highly toxic, heavy metal'. You can usually assume that it will be followed up by a plethora of similar misunderstandings and misconceptions, all common in the chemtrail hive-mind. I just think that there are some very serious comprehension shortfalls here, but that's generally apparent when people start going on about aluminium being a 'highly toxic, heavy metal'. Yes, a quick glance at the periodic table will show you that there are only four metals "lighter" than aluminium (five if you count boron as a metal), so I have no idea where the "heavy metal" thing comes from. Whether you use atomic mass, atomic number or physical density as your criterion, there is no way you can call aluminium "heavy"! I think people just don't understand (or don't want to admit) that the chemical test breaks compounds down into their constituent elements, so ANY aluminium compound will test positive for aluminium. There's no standard definition of heavy metal. Cadmium is generally considered one, but Gold is not despite higher atomic number and higher density. Aluminum is not considered a heavy metal, at all, though. Its toxicity is also negligible in soil - not zero by any means, but the amount needed to be toxic is just incredible. Because if you do contaminate soil with free aluminum, it won't stay contaminated, because free aluminum is not stale. It will oxidize. The smaller the pieces, the faster they will oxidize because oxidation is relative to surface area. Dust, like you'd get machining parts*, will oxidize within minutes to hours depending on the size of the pieces and environmental factors. Aerosolized aluminum at ground level would oxidize in seconds. Aluminum oxidizes the same way copper does - the oxide produces a barrier on the surface, protecting the metal from further oxidation but also protecting the environment from the metal. It doesn't corrode like iron, which flakes off exposing new metal to oxidation and eventually rusting away to dust. It's not that hard to understand. hiilikeyourbird thinks the test would only show aluminum if it was "free aluminum". This is a very common misconception. I'm not sure even if Dane fully understands it. I should probably do a nice thread/infographic to explain it, as it comes up all the time. A peristaltic pump delivers an aqueous or organic sample into an analytical nebulizer where it is changed into mist and introduced directly inside the plasma flame. The sample immediately collides with the electrons and charged ions in the plasma and is itself broken down into charged ions. The various molecules break up into their respective atoms which then lose electrons and recombine repeatedly in the plasma, giving off radiation at the characteristic wavelengths of the elements involved. Quite a lot of jargon there, but basically the sample is heated up to about 12,000 degrees Fahrenheit, which breaks all compounds down into their constituent atoms, each of which then emits a characteristic "fingerprint" that can be detected. Strips it down to the atoms, then blasts off the electrons to make it sing. Problem is, lots of people don't really understand plasma, electrons, atoms, molecules, and compounds. Now you might think this is really trivial stuff that everyone understands (at least the "atoms vs. molecules" part). But there's a very large number of people who have absolutely no idea how chemistry works. So it's quite hard to explain to people, and then it just becomes this issue of trust. So you can say "that test will detect the aluminum in Bauxite exactly the same as it detects 'free' metallic aluminum", and you will get the response "but free aluminum does not exist in nature, so why is it being detected in this test". People miss the point, because they A) don't really understand it, and B) They trust "authority" figures like Dane, who don't really understand it either. A vital point to keep in mind here is that there is nothing wrong with not understanding this. Billions of people don't. Most people don't. Lots of "debunkers" don't. It's knowledge that seems basic to some, but is esoteric to others. Think how some people don't understand basic algebra, like how solving 2x+2=4x seem obvious to you, but it totally gobbledygook to some of your friends and family. Same thing with chemistry. So it's important not just to throw your hands up in the air and dismiss people as stupid, but instead to understand their misunderstanding and try to communicate with this in mind. Isn't December kinda late, too? What about in Canada? I don't think Arizona holds the "market" for spider webs all over the world. If it's just "water," what is the point in spraying water from military planes? They're spraying SOMETHING, because passenger planes do not do this. I've seen photos of the sky covered with chemtrails. This thread, however, is about the fibers that were found. There are many other threads discussing the formations of contrails. I'd appreciate it if you could review the posting guidelines before posting again. So it's important [...] to understand their misunderstanding and try to communicate with this in mind. I am convinced that in this case, it is unavoidable to clear up the misunderstanding because it is so central to the CT. The soil tests come up like on cue every time the contrail persistence issue is exhausted. On the other hand, I'm confident that the principle of molecules can be explained in simple terms, with images and the help of analogies that most people can relate to - like the "H2O" molecule which behaves so much different than its components, or "rust" as an example of metal turning into dust, changing its properties completely. Even if people may not understand at first, the point is to make them aware that there might be something which they did not take into account previously. I think it is useful to not hold back on using the terms "molecule" and "atom". I tried to add the following comment to the CBS5 page but there seems to be a hard limit on the number of comments; anyway, mine did not show up. "The metal traces found in the samples are likely from dust accumulated in the silk. Dust is mostly soil / minerals, and most mineral molecules are based on metal atoms. Clay contains aluminum, for instance. This is what shows up in the analysis results. There were no FREE metals around." In my area of Canada, just north of Minnesota, it was minus 20 C a few weeks ago. On Remembrance Day ( Veterans Day down yonder) it was minus 10C. No spider was crawling about by Halloween. Others areas, notably Vancouver and Victoria see milder temps. Now June, July, August and even September are quite amenable to many varieties of spiders in all non-Arctic provinces. I can attest to walking on the beach and having a spiderling, blown by the wind, land on me and have his trailing strand of silk stick to me. In addition we have Tent Catepillars here which also produce a silk. When they are in season , walking through a deciduous tree stand can be utterly disgusting as they drop to the ground on that silk, often hundreds of these strands hanging from the trees that glom onto your cloths and hands and face. Wrong. Passenger jets are quite prolific in producing contrails. In fact that's why you see portions of the sky rife with contrails, because passenger jets follow specific routes. As readily demonstrated in the links Mick supplied above. The theme is self debunking. Aluminum exclusively exists in the air or soil as a compound ( other than in enviroments that strongly promote reduction processes) because it reacts so readily with, among other elements, oxygen. That is a point which chemtrailers promote quite vocally. Spraying elemental aluminum in fine particles from thousands of feet above the surface will garuntee it is oxidized by the time it reaches the surface. One need only drive down a gravel road on a dry summer day ( around here gravel consists primarily of granite) and note that the dust, blown up to a grand height of a dozen feet or so, at best, (due to a passenger car, large trucks or busses send it higher) takes several minutes to settle out to the surface again. Much less dense, particulate elemental aluminum sprayed from a jet moving at several hundred MPH, ensuring mixing with the atmosphere, at several hundred or thousands of feet agl is going to take much longer, hours perhaps, to reach the surface. Ample time to oxidize even if collected asap. Finding fine particulate elemental aluminum in a dust sample would be rare to impossible, unless it has been deposited in high concentration very recently and tested immediately. Simply collecting the dust and spending hours or days transporting it to a test lab makes the idea that any elemental aluminum exists in the sample quite ridiculous. So the logical conclusion is that what is being found in these tests is aluminum as a component of compounds found in the samples.